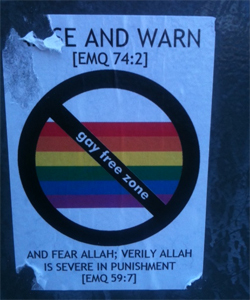 A small group of East End residents are to tackle anti-gay stickers by ‘love-bombing’ the area with their own posters. On Monday, PinkNews.co.uk reported that homophobic messages had been placed around the area, declaring it a “gay-free zone”. They have also been posted on Whitechapel High Street and outside a school. Wendy Richardson, an actor who lives in Hackney, says she and four friends will meet on Friday to cover the stickers with messages of love. The group plans to use quotes from writers Anais Nin, Anne Frank, Coretta Scott-King and Rikki Beadle-Blair to spread the word. Ms Richardson said she had informed local police of her plan. “Everyone has an obligation to ensure that people have rights and dignity. It’s just a question of doing something to counter the hate. People should not be afraid of reporting such incidents to police, she said. The group will meet outside Shoreditch Town Hall at 9am on Friday and volunteers are welcome. Gay rights campaigner Peter Tatchell said this week that LGBT Muslims were living in fear of attack in the East End. Later today, Tower Hamlets council and the East London Mosque are expected to release a joint statement condeming the stickers.